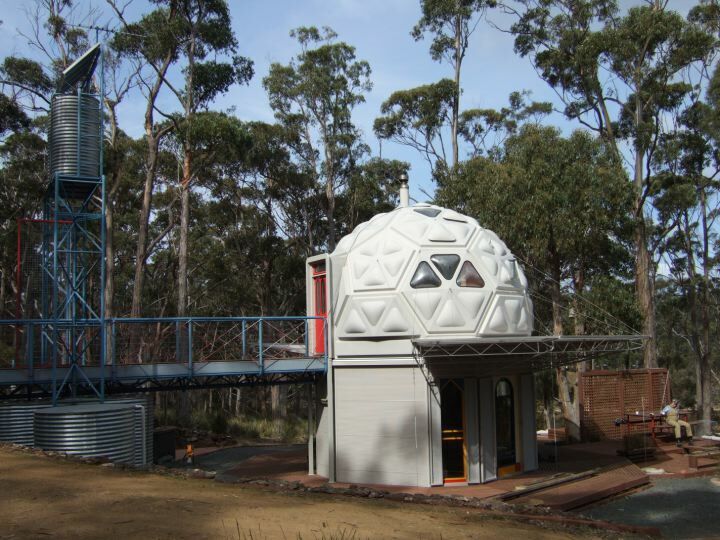 The Geo-Dome Observatory, or our Bruny shack……………. …………..is completely self-sustaining regarding all its utilities. We run 240 volts for the power points and 12 volt lighting – all from our solar panels set up on top of the tower at the bridge’s entry. The two water tanks that also sit on top of the tower provide enough gravity feed for a decent shower and a constant supply of water, all of which is naturally sourced and stored in the two rain water tanks that flank the tool shed (a customised water tank). A small motor pumps up water (solar powered) to the two tanks to top up and replace the water used. 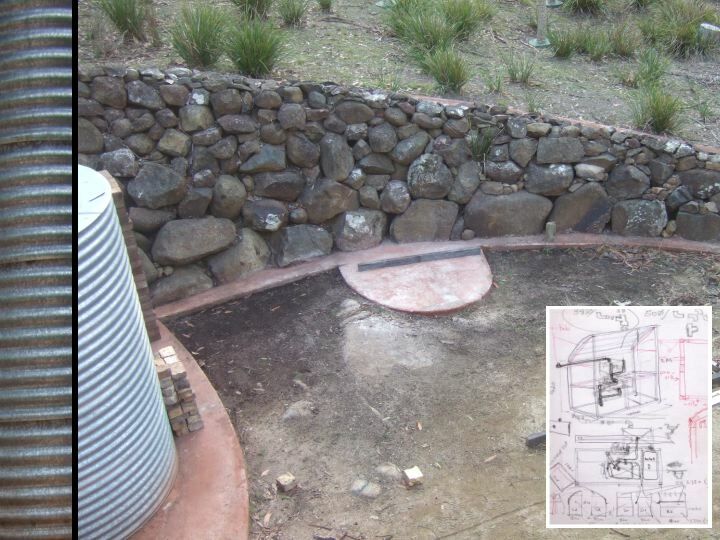 A septic tank deals with effluence and a series of seepage channels caters for all grey waste – which waters the various trees around the place. 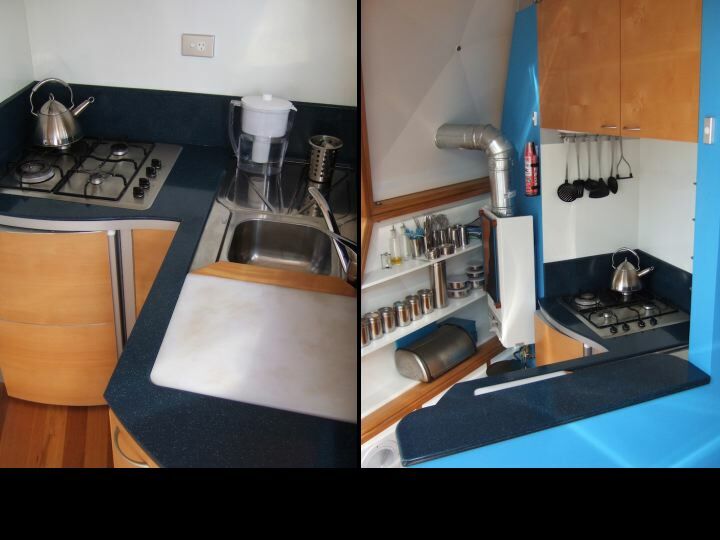 The kitchen inside is small……….. …….rather like a ship’s galley. Despite having all that’s necessary, I missed not having an oven that could utilise some of the fabulous clay pots in my collection. 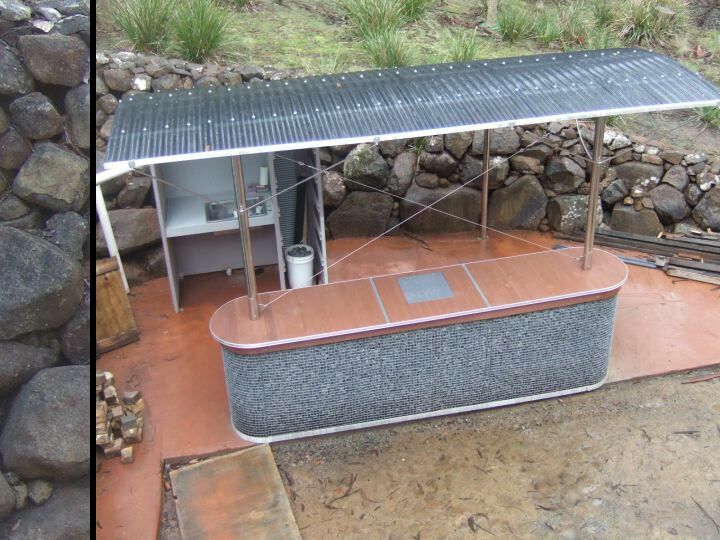 So in 2008, the outdoor kitchen was started and has been ongoing ever since. It started with the foundations………… The site and John’s sketch plans. 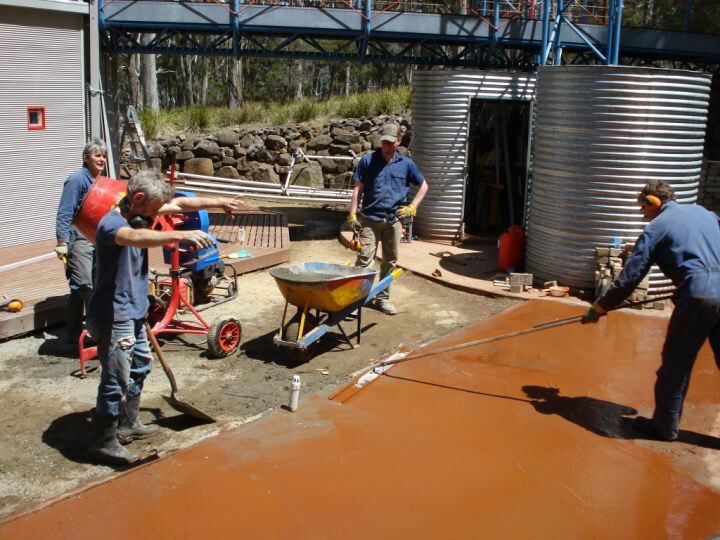 Family working bee – casting the slab. 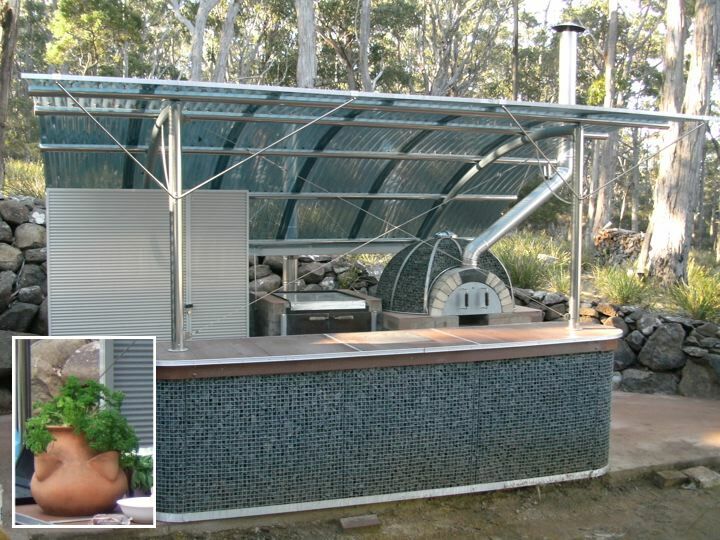 Gabion walled workbench with a marble insert (for bread making) – the stainless steel and polycarbonate roof was designed on the basis of leftover material from a previous public art commission – and the start of the kitchen sink and storage unit. Brunyfire grinding the steel plate for the barbecue……….. ………….and proceeding with the foundations of the barbecue and the wood oven. 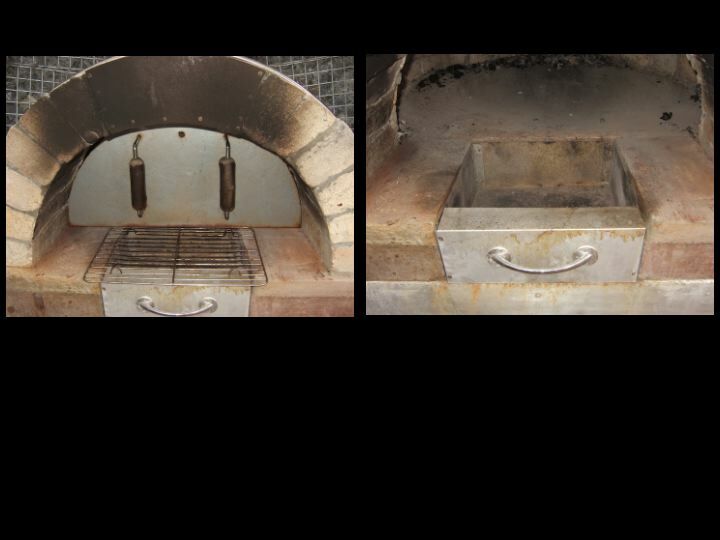 Numerous ovens were sought for the design of this oven, and in the end, the plan and methods I came up with to build it were a combination of several. 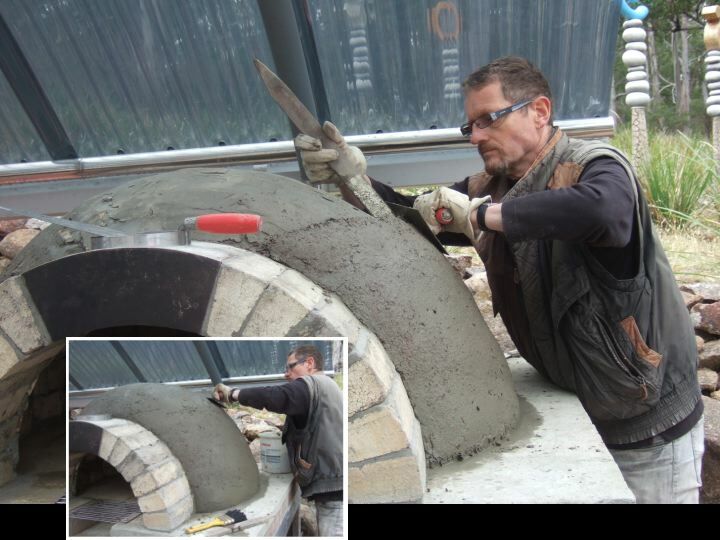 But the making of the mould to build the brick dome was based entirely on clay making techniques – that of using a plywood template to ‘turn’ the sand dome support. 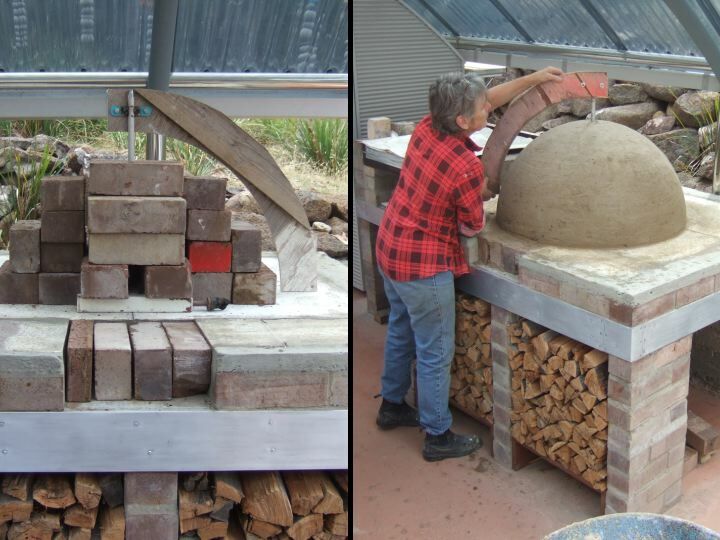 (Check out Brunyfire’s library for books and links regarding wood ovens). 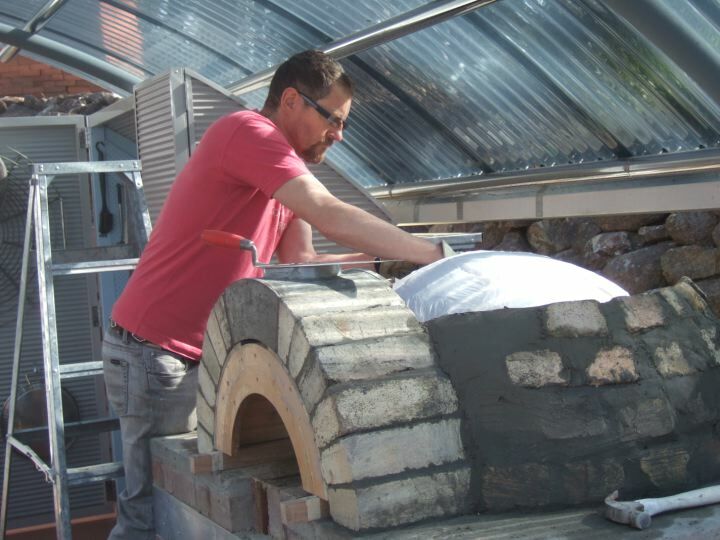 John building the brick dome with half bricks against the plastic covered sand mould. The door arch already in place with steel chimney base in position. Removing the plywood door arch mould after the completion of the brick dome. 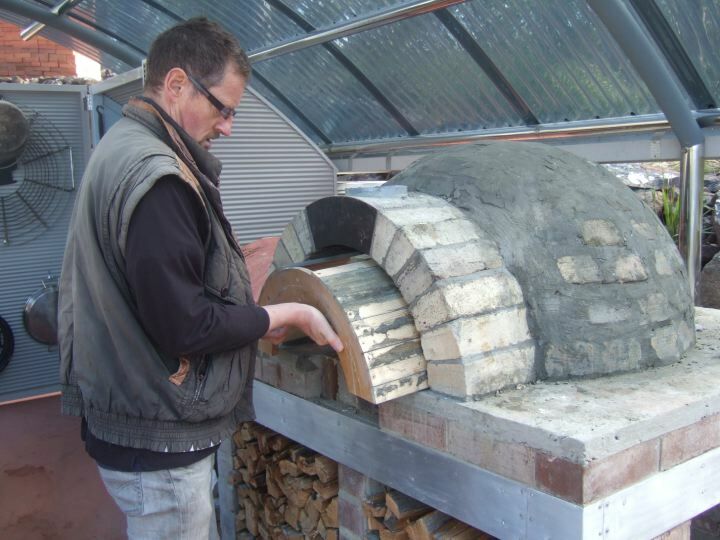 John packing an adobe (cement, sand, wood chip) mixture to the brick dome as an insulating layer. 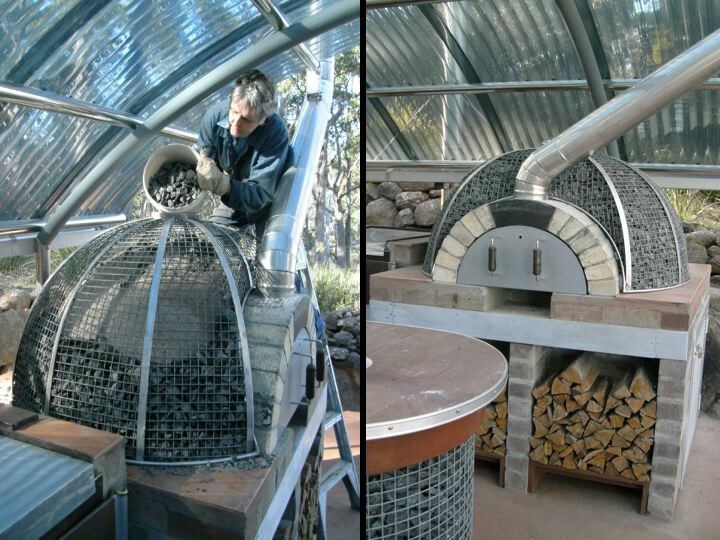 John then fabricated an ‘orange’ peel dome cage that was slipped over the dome, and this was filled with small rocks – gabion style – a stainless stell chimney was inserted into the hole in the arch, to vent smoke out of the kitchen area. 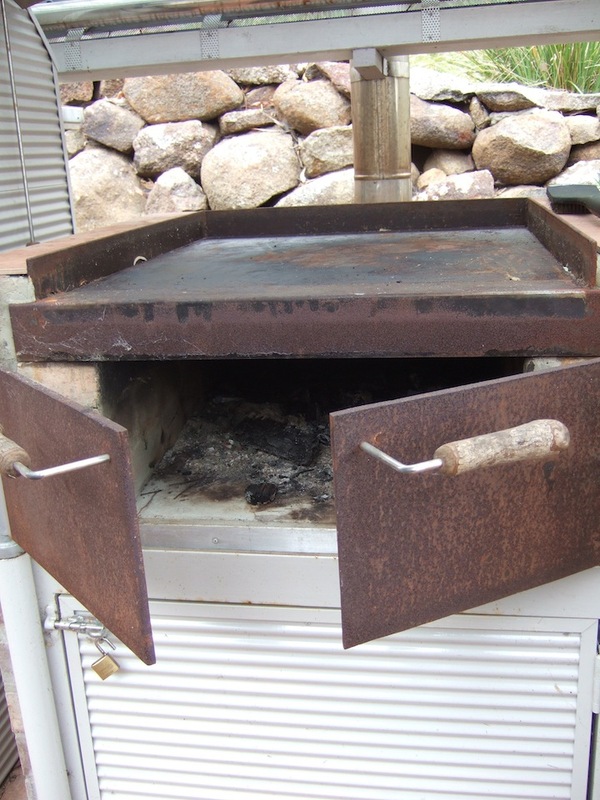 The finished oven has a double steel door (with horizontal scrub handles) that, when shoved far enough, closes off the oven by isolating the opening to the chimney and acts like a damper. 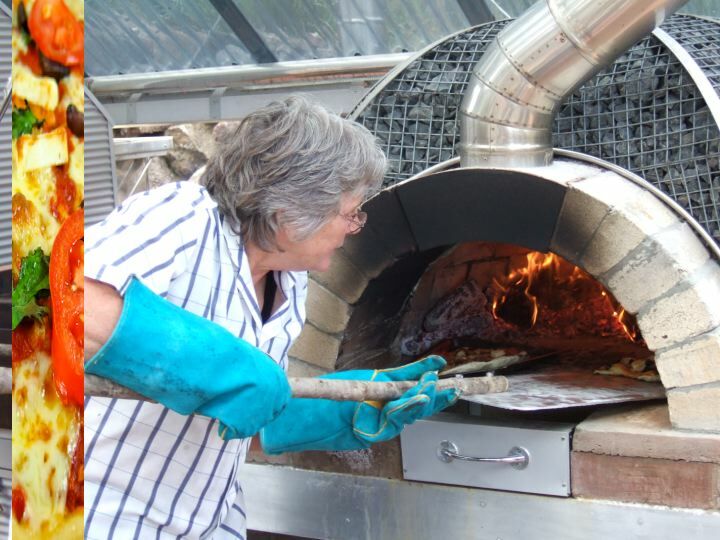 The ash pan (for sweeping out the ashes in readiness for bread baking) can also be used as a grill to pre-cook food before being placed in the oven (see Bangers ‘n’ mash). Finished kitchen with barbecue (with hinging steel doors, also with horizontal scrub handles) and wood oven. The barbie (with storage underneath). 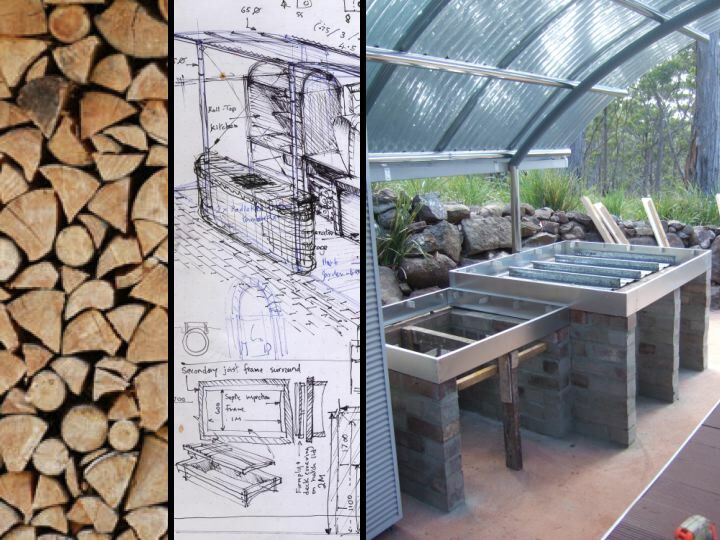 Am planning on using this and the wood oven to experiment with hot smoking a range of foods, particularly exploring different woods such as fruit woods and natives. 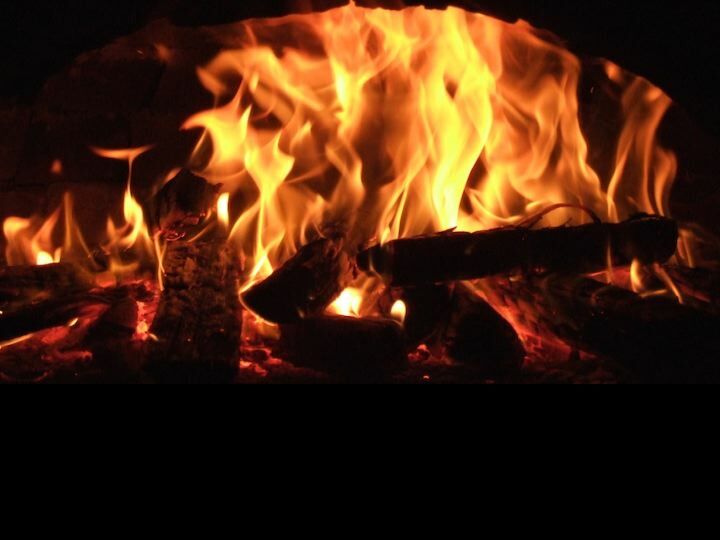 Have been inspired here by the Kiwi, Al Brown who discusses the flavours that different woods can impart to food in his new book Stoked: Cooking with Fire. (Brown and his partner Steve Logan run the hugely successful Logan-Brown in Wellington’s famed Cuba Street, New Zealand – check out their book Hunger for the Wild based on their TV programme). 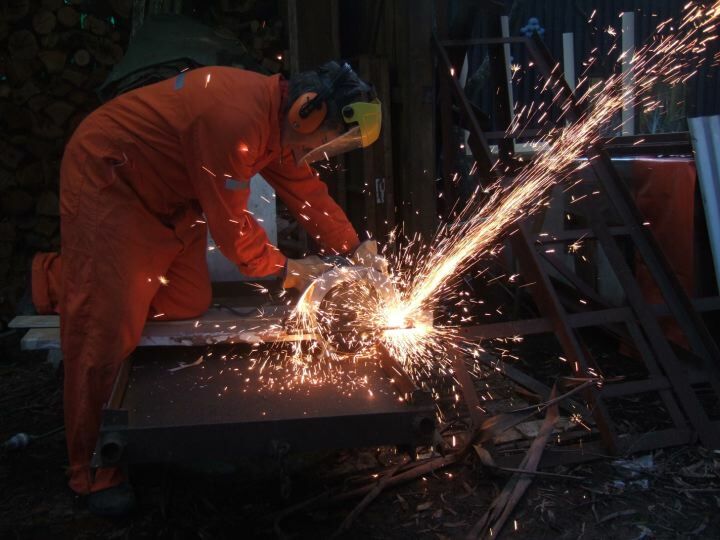 As has been the tradition throughout the building of the shack, recyclable materials have been used as much as possible. In this instance, the kitchen cupboard unit has a sink sourced from the tip shop (a second tip shop sink is around the back of the unit attached below the roof gutter to collect water for washing up) and recycling bins for drawers. 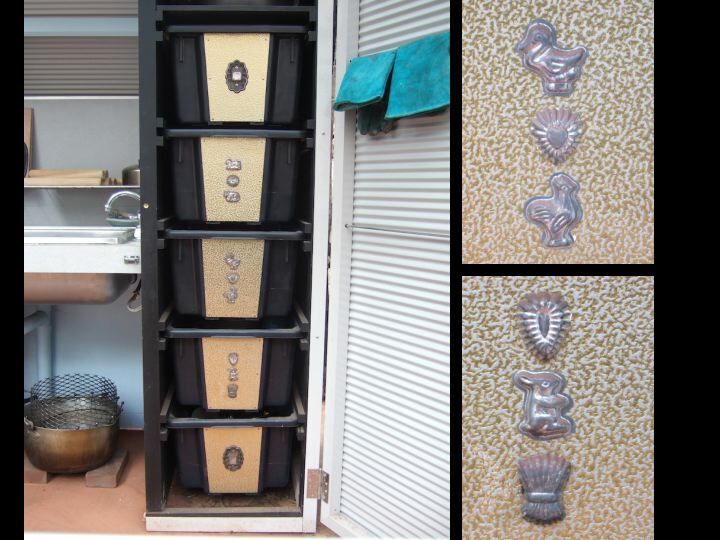 The decorative metal panel on the front of the drawers is some left over material from a previous project, and the quirky details are old fashioned chocolate moulds from Vinnies. Brunyfire’s first pizzas! I want to come and cook with you in that kitchen! Inspiring!